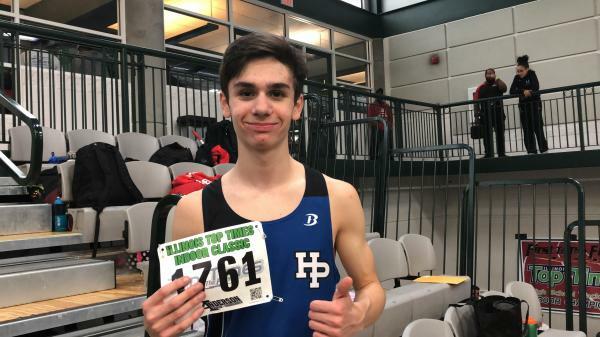 Sophomore Jason Polydoris qualified for 3200 Meter Run at the Illinois Top Times Indoor Championships hosted by Illinois Wesleyan University. Going into the race he was seeded 14th out of 15 runners that qualified. He was also the only underclassman in the race. Jason got out well and was able to get into good position early. At that point, instead of settling into the flow of the race, he was a bit overly-aggressive and moved up with the lead pack. Jason came through the 1600 in a new personal best time of 4:39! After the fast first mile, he started to struggle to hit his goal splits. He battled tough to hang on with a pack of three other runners. In the final lap, he was able to dig deep and pull away from the pack to finish in 10th place. Jason’s final time improved his own HPHS sophomore indoor school record by just over 2 seconds. He crossed the line in 9:37.64! This was also the 6th fastest indoor 3200 meter run time in HPHS school history! This was a tremendous experience for Jason. Despite making some tactical mistakes during the race, he was able to learn a great deal from competing at this meet. He has proven that training beats talent over time. He has outworked many distance runners that were as good as if not better than he was freshmen year and even in cross country this fall. He is setting a tremendous example for all of his teammates in the way he makes his training a priority including taking care of all of the details needed to stay healthy and perform at his best. Look for more excellent accomplishments from Jason in the remainder of his career at HPHS and beyond!